Dream Makers Vacation Services Co Owner, Michael McHugh, arrives at Beaches Turks & Caicos for a sneak peek of the new Key West Village that is opening on May 22nd 2013. Robyn shares about her second day of the Sandals WeddingMoon Special Certification in sunny Jamaica. Dream Agent Robyn Ayers summarizes her first day of the Sandals WeddingMoon Specialist Certification at Sandals Whitehouse in Jamaica. As Dream Agent Robyn Ayers' Dream Vacation comes to a close, see the two favorite places where she, along with her husband, spend their final day at Sandals Whitehouse. After the excitement of yesterday's excursions, Dream Agent, Robyn Ayers and her husband decided that Day 5 in Paradise was all about quality rest and relaxation. Dream Agent, Robyn Ayers enjoyed Day 4 at Sandals Whitehouse by participating in one of the many great excursions that Island Routes offers. Dream Agent, Robyn, and her husband, Wes, continue to enjoy the beautiful beach and wonderful food & service at Sandals Whitehouse in Jamaica. 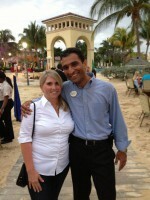 Robyn even got a chance to catch up with Rick Burrowes, the hotel manage at Sandals Whitehouse. Dream Agent, Robyn Ayers, enjoys the restaurants and a meeting with General Manager, Mr. G at the beautiful Sandals Whitehouse. Dream Makers Vacation Services agent, Robyn Ayers, traveled to the beautiful Sandals Whitehouse in Jamaica with her husband. On their arrival day, they enjoyed a helicopter ride through Island Routes from the Montego Bay airport to the resort, got checked into their Grand Luxe Beachfront Concierge Suite and enjoyed an Asian cuisine at Jasmine's for dinner. Beaches Turks & Caicos is our favorite family resort. It has something for everyone. It is our favorite family resort because it is 10 minutes from the airport, the beach is pristine, the ocean is crystal clear (and full of sealife), snorkeling and scuba are included (if you are certified), the water park is fun, there are many restaurant options, and the kids club is great. They have one of the highest returning guest ratios because they do things right and clients always return happy.